Skype conference with French middle and high school students and Simone Liebster. 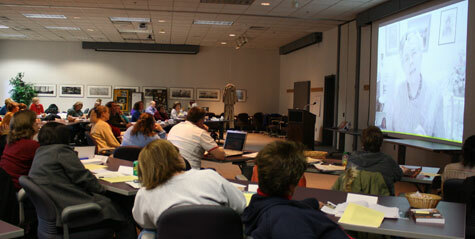 Held at Arizona State University West Campus, the conference theme was "Social Studies: To the Centennial & Beyond." 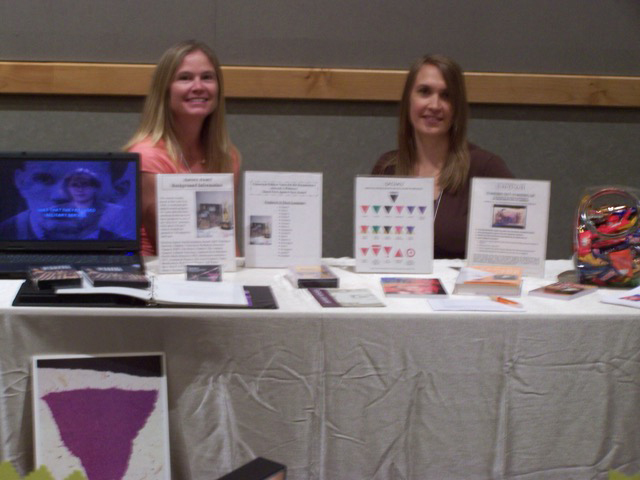 Exhibitors Renee Ochsner and Kristin Walter shared information about the Nazi persecution of Jehovah's Witnesses and curriculum materials from the Arnold-Liebster Foundation website. Arizona Council for the Social Studies includes the Arnold-Liebster Foundation on its Websites of A.C.S.S. Affiliated Organizations & Classroom Resources for teachers and social studies specialists. Gaye Flowers and Marge Fulton presented this workshop on October 15 as part of the Illinois Council for the Social Studies Annual Conference in Lisle. High-ranking officials, scientists, and other professionals who considered themselves good, law-abiding citizens were later convicted for Nazi war crimes. Others, however, refused to violate their conscience and the very principles which madethemexemplary citizens. 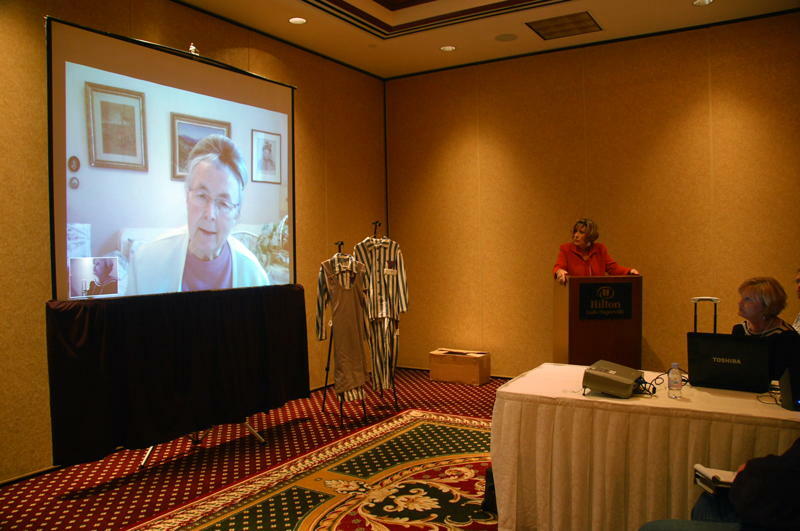 A Skype interview with one such survivor, Simone Liebster, was a highlight of this presentation. This workshop was held on July 26, 2010 at Alabama State University in Montgomery. Leonita Nelson, workshop presenter and 5th grade teacher with Montgomery Public Schools, demonstrated how to use video conferences to integrate technology in the classroom. Educators had an opportunity to interview Simone Arnold Liebster from France through a live Skype interview, focusing on the value of using her testimony to help students understand the importance of adhering to one's conscience and taking a stand for what is right. This workshop was presented on July 14, 2010 as part of a five-day Holocaust and Human Behavior seminar presented by Facing History and Ourselves and South Carolina Council on the Holocaust at Columbia College. 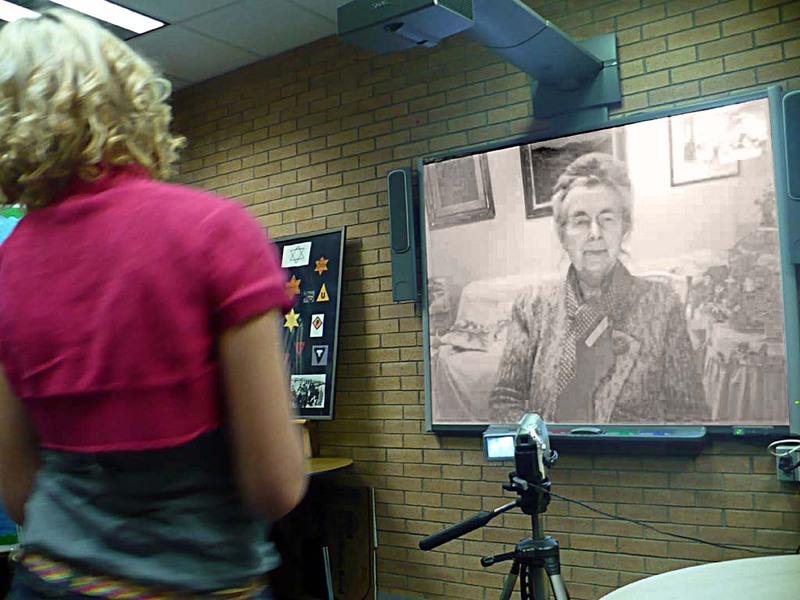 Using primary documents and the first-person survivor testimony of Simone Arnold Liebster in an interactive Skype conference from France, presenter Diana Zientek focused on the difficult choices made by Jehovah's Witnesses, a group of people who adhered to their beliefs despite brutal efforts to make them conform to Nazi ways. 9th Annual Rosen Summer Symposium "Remembering the Holocaust." Contributed to the Institute by providing teacher packets and curriculum resources. Diana Zientek presented information about the Nazi persecution of Jehovah's Witnesses. Skype conference with 5th grade students and Simone Liebster. Skype conference with 6th and 7th grade students and Simone Liebster. This three-day conference highlighted Perspectives on Genocide in the Shadow of the Holocaust and was held at Western Carolina University in Cullowhee, North Carolina. On March 5th, Diana Zientek presented the experience of Jehovah's Witnesses, including a Skype interview with Simone Liebster for which teachers had the opportunity to submit interview questions in advance. Skype conference with 8th grade students and Simone Liebster. Three Skype conferences with 8th grade students and Simone Liebster.